The thyroid is an endocrine gland shaped like a butterfly. It is around two inches long and less than one ounce in weight. The gland is located in the front part of the neck, at the base, below the thyroid cartilage (Adam’s apple), and it is made up of two lobes connected by a thin strip of tissue called the “isthmus”. Each lobe lies on one side of the trachea. The thyroid can be affected by different conditions that cause either hypothyroidism or hyperthyroidism. Hypothyroidism is when the thyroid is underactive. Signs of hypothyroidism include tiredness, dry skin, thinning hair, and constipation. It is a very common condition, and it affects more women than it does men. Hyperthyroidism is the opposite; it is when the thyroid is overactive and produces an excess of thyroid hormones. Symptoms include hyperactivity, sensitivity to heat, hair loss, anxiety, irritability, and trembling. Statistically, it is estimated that around 20 million Americans have a known thyroid issue. But, because it is a regularly undiagnosed problem, around 12 million of them don’t know it: https://www.drlam.com/articles/adrenal_fatigue.asp. 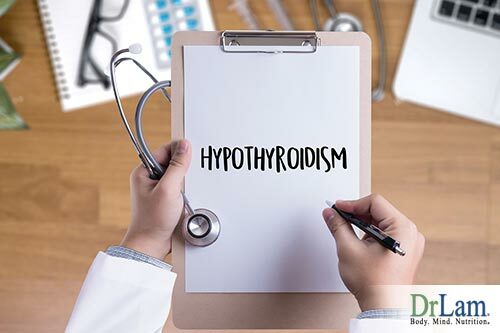 “Thyroids” is also a name for the hormones that the thyroid gland produces, and they are essential for metabolism, energy use, warmth, and for the proper functioning of the heart, muscles, brain, and many other organs. These hormones are secreted by the thyroid gland into the bloodstream and are then distributed to the entire body. Almost every cell in the human body needs thyroid hormones to regulate its metabolism. This is how important these hormones are. In development, the thyroid gland starts off in the back of the tongue when the fetus is in utero. It then begins to slowly migrate towards the front, reaching the neck before birth. There are rare cases when the migration either gets stalled, and the thyroid remains in the back of the tongue, or it goes too fast, and the thyroid ends up in the chest. The thyroid gland produces the hormones necessary for controlling metabolism, helping to regulate such processes as heart rate, body weight, breathing, menstruation, body temperature, cholesterol, muscle strength, and more. Thyrocytes are the thyroid cells that produce thyroid hormones. They create the hormones triiodothyronine (T3) and thyroxine (T4) by combining iodine taken from food with tyrosine, an amino acid that is used to synthesize proteins. Thyroid cells are the only cells in the body that can absorb iodine. They make four times as much T4 as they do T3, but T3 is about four times as strong as T4. They also produce small amounts of T1 and T2 hormones, whose functions are not yet fully understood. T3 is the active hormone, while T4 is the prohormone. The human body only has T3 receptors, so T4 is converted into the active T3. In order to produce and secrete thyroid hormones, the thyroid has to be stimulated into doing so. Then, when there is enough thyroid hormone in the bloodstream, the thyroid needs to be inhibited. This mechanism is controlled by the hypothalamus and pituitary gland in the brain. First, the hypothalamus secretes the thyrotropin-releasing hormone (TRH), which tells the pituitary gland to release the thyroid-stimulating hormone (TSH). TSH signals the thyroid gland to produce T3 and T4. These two hormones should remain at optimal levels for the body to function properly. Too much or too little of either one and eventually signs of hypothyroidism or hyperthyroidism will appear. The delicate balance is maintained through TSH. If T3 and T4 hormones are too high, the release of TSH by the pituitary is decreased. In this case, the thyroid is not stimulated into more hormone production. 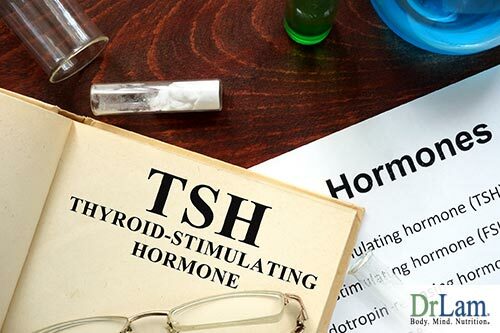 If the levels are too low, then more TSH is released to stimulate the thyroid gland. You can imagine the pituitary like a sensor that gauges when to turn on or turn off the thyroid. It is given an optimal setting by the hypothalamus, then it analyzes the blood levels of T3 and T4 accordingly and either releases or stops releasing TSH. 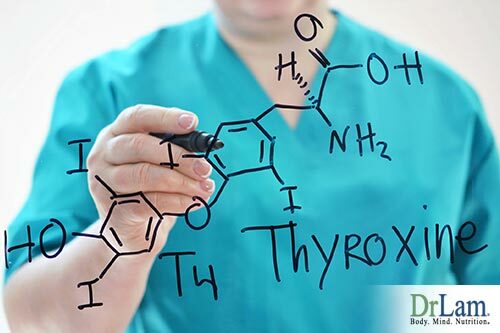 The thyroid hormones T3 and T4 are partially made of iodine, and their names refer to how many iodine molecules they contain. T3, or triiodothyronine, has three iodine molecules, and T4, or thyroxine, has four. T4 is the major form of thyroid hormone found in the blood and has a longer half-life than T3, meaning it takes longer for T4 to lose half of its physiological activity. The thyroid produces 20% of the T3 the body needs, while the other 80% is obtained from the conversion of T4 to T3. T4 is the prohormone for T3. A prohormone is the precursor of another hormone, and it is an inactive form of the hormone it is to be converted to. It doesn’t have much of an effect other than to circulate in the bloodstream until it is needed for the conversion. T4 is converted to T3 by a process of deiodination, the removal of one iodine molecule within the cells by deiodinases. Deiodinases are selenium-containing enzymes. Thyroid hormones also need iodine. Thus, a deficiency in dietary iodine or selenium can inhibit production of the T3 hormone. The daily production of thyroid hormones is approximately 100 mcg of T4 and 30 mcg of T3 (20% from the thyroid and 80% from deiodination). T1 and T2 are produced in trace amounts through the same process. There is also a hormone called “reverse T3” ( rT3). It also has three iodine molecules, but they are arranged in a mirror image of the active T3 hormone. Reverse T3 blocks receptor sites of T3, and it may also have actions of its own, beyond the blocking, that we’re currently unaware of. This rT3 acts as a braking mechanism, reducing the amount of T4 to T3 conversion due to shunting effect. When the body wants to slow down the metabolism, it makes less T3 and more rT3. 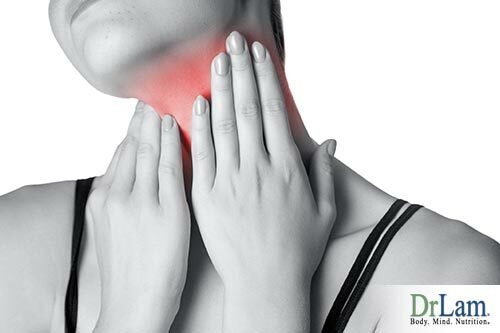 Worldwide, iodine deficiency and a condition called goiter are the most common triggers of signs of hypothyroidism and primary hypothyroidism, which is when the thyroid gland itself is underactive. “Goiter” just means the thyroid gland is enlarged, but it does not mean that the gland is not working properly. This is why goiter can be present in a thyroid that is hyperactive as well. The reason it becomes enlarged when there is iodine deficiency is that, without enough iodine, the thyroid cannot produce enough thyroid hormones. Low T3 and T4 levels in the blood cause the pituitary gland to secrete more TSH, which then stimulates the thyroid to produce hormones, making it grow in size. As it receives more TSH, the thyroid enlarges more and more. This is a goiter. When iodine deficiency is not present, the next most common cause of hypothyroidism and goiters is the autoimmune disease Hashimoto’s thyroiditis, which will be covered in more detail below. Another cause of goiters is a condition called multinodular goiters, where the thyroid gland contains nodules. The cause of multinodular goiters is still unknown. Other than that, goiters can be caused by injury, tumors, infections, and genetic defects. Goiters, nodules, and tumors are sometimes removed surgically. In some cases, the entire thyroid is removed. The removal of part or all of the thyroid creates hypothyroidism. Other causes of signs of hypothyroidism include congenital hypothyroidism, certain drugs, thyroid radiation treatment, and inflammation. With congenital hypothyroidism, a baby is born with an underdeveloped or malfunctioning thyroid. This creates problems with growth and intellectual development later on, and it needs to be addressed early in order to avoid these issues. This is why, in the US for example, newborns are tested for hypothyroidism. Drugs, such as amiodarone, beta-blockers, and Dilantin, can also get in the way of healthy thyroid function and hormone production. Other drugs, such as lithium for bipolar disorder, and interferon alpha for cancer treatment, can also cause hypothyroidism. The inflammation these medications create will last as long as the medication is taken.